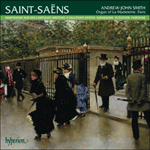 The Élévation ou Communion in E major, Op 13, was dedicated to one of Saint-Saëns’ friends, Alexis Chauvet, whom the composer helped secure his old position at St Merry in 1863. Whilst it survives in an early manuscript that may date from as early as 1856 (Bonnerot gives 1859) it was not published until its inclusion in a volume by Canaux et Maeyens-Couvreur in 1865. There remains the possibility that it originated as a now-lost motet for upper voices though by the time of its publication it was on two staves and carried the indication ‘2 Claviers et Pédale’. The work clearly enjoyed a certain success and was republished by Durand in separate versions for organ and harmonium in 1880 and in Saint-Saens’ own transcription for piano solo in 1886.